The 2010 Northern Hemisphere summer heat waves included severe heat waves that impacted most of the United States, Kazakhstan, Mongolia, China, Hong Kong, North Africa and the European continent as a whole, along with parts of Canada, Russia, Indochina, South Korea and Japan during May, June, July, and August 2010. The first phase of the global heatwaves was caused by a moderate El Niño event, which lasted from June 2009 to May 2010. The first phase lasted only from April 2010 to June 2010, and caused only moderate above average temperatures in the areas affected. But it also set new record high temperatures for most of the area affected, in the Northern Hemisphere. The second phase (the main, and most devastating phase) was caused by a very strong La Niña event, which lasted from June 2010 to June 2011. According to meteorologists, the 2010–11 La Niña event was one of the strongest La Niña events ever observed. That same La Niña event also had devastating effects in the Eastern states of Australia. The second phase lasted from June 2010 to October 2010, caused severe heat waves, and multiple record-breaking temperatures. The heatwaves began on April 2010, when strong anticyclones began to develop, over most of the affected regions, in the Northern Hemisphere. The heatwaves ended in October 2010, when the powerful anticyclones over most of the affected areas dissipated. A map of the above-average temperatures, caused by the global heat waves, in June 2010. The heat wave during the summer of 2010 was at its worst in June, over the Eastern United States, Middle East, Eastern Europe and European Russia, and over Northeastern China and southeastern Russia. June 2010 marked the fourth consecutive warmest month on record globally, at 0.66 °C (1.22 °F) above average, while the period April–June was the warmest ever recorded for land areas in the Northern Hemisphere, at 1.25 °C (2.25 °F) above average. The previous record for the global average temperature in June was set in 2005 at 0.66 °C (1.19 °F), and the previous warm record for April–June over Northern Hemisphere land areas was 1.16 °C (2.09 °F), set in 2007. The strongest of the anticyclones, the one situated over Siberia, registered a maximum high pressure of 1040 millibars. The weather caused forest fires in China, where three in a team of 300 died fighting a fire that broke out in the Binchuan County of Dali, as Yunnan suffered the worst drought in 60 years by February 17. A major drought was reported across the Sahel as early as January. In August, a section of the Petermann Glacier tongue connecting northern Greenland, the Nares Strait and the Arctic Ocean broke off, the biggest ice shelf in the Arctic to detach in 48 years. By the time the heatwaves had ended in late October 2010, about $500 billion (2011 USD) of damage was done, in the Northern Hemisphere alone. The World Meteorological Organization stated that the heat waves, droughts and flooding events fit with predictions based on global warming for the 21st century, include those based on the Intergovernmental Panel on Climate Change's 2007 4th Assessment Report. Some climatologists argue that these weather events would not have happened if the atmospheric carbon dioxide was at pre-industrial levels. A heat wave hit Eastern Europe as exceptionally strong jet stream winds blew in from the Sahara across the Balkans and into both Poland and Ukraine on June 10. The Polish Institute of Meteorology and Water Management (IMGW) warned of temperatures in Poland exceeding 30 °C for the next 5 days, followed by heavy winds, rain storms, thunderstorms and possible flooding especially in the north-west of the country and neighbouring parts of Germany. The period between June 13 and 19  saw a low pressure zone move south eastwards taking a shallow pool of cooler air south eastwards across from the North Atlantic into Ireland, Wales and most of England. As the floods eased in Central Europe and the Balkans, apart from those in Romania, temperatures began to climb across Western Europe, including Frankfurt am Main in Germany and the UK on June 30. On July 2, Brussels saw its hottest day since 1976 and France, Germany and the Spanish resort Benidorm experienced record temperatures. Several heavy thunderstorms hit the Low Swiss Alps, accompanied by heavy sleet in some places. On July 3, a heat wave hit parts of Ryazan Oblast, Krasnodar Krai, and the cities of Copenhagen, Bucharest and Budapest, killing a Romanian man with heat stroke. Heavy thunderstorms hit the High Swiss Alps, accompanied by heavy snow in some places. On July 6, 3 low pressure areas moved towards and settled near the Black Sea after a week a high pressure in the region's jet stream far northward in its trek through Europe. The National Oceanic and Atmospheric Administration's GFS numerical model predicted the same weather for the following week. A meteorological synoptic pressure corridor ran from Germany and Poland east and northeast to western and north western Russia causing temperatures that were 4 °C, 8 °C and in one case 10 °C above the seasonal norm. Cities from Berlin and Warsaw to Kiev, Minsk, Moscow and St. Petersburg may well reach the 33 °C to 35 °C range. Berlin and Warsaw recorded temperatures of 33 °C, while highs of nearly 34 °C in Moscow broke records. Earlier in June, temperatures in Minsk hit 30 °C, while temperatures as high as 34 °C were observed in Kiev. By July 8, a major heat wave hit most of Europe, European Russia and North America. Both the French and Belgian authorities were on alert to respond to possible incidences of heat-related illnesses following the death of a Frenchman in the north of the country due to heat exhaustion. Brussels saw its next hottest day since 1976, while Portugal and Germany experienced record high temperatures. Austria's Central Institute for Meteorology and Geodynamics (ZAMG) issued public safety warnings on the 8th as it predicted temperatures as high as 35 °C (95 °F) by the weekend. The centre expected similar conditions continuing into the beginning of next week, where it would end in a heavy Alpine downpour. The Swiss Meteorological Office reported that a record 34.8C was set in Basel and warned of both forest fires in the persistently drought-hit southern canton of Valais. The Swiss Health Office offered the public safety advice. The ozone level rose badly and was more than twice the permitted level at 257 microgrammes per cubic metre in Lugano on Friday, and things were in a generally bad condition across the Swiss Alps as a whole. Extreme heat and ozone levels were also harming tourists at the Gotthard Road Tunnel on the 8th and 9th. The Swiss Ornithological Institute, based in Sempach, said young swifts were stifling to death and others were jumping out before they could fly properly, as temperatures reached 50 °C (122 °F) in their under the roof nests. Most of them lived at the institute care home. A heavy rainy thunderstorm hit Zürich on the 10th  and the Swiss-French border. They also threatened to close the Avoriaz stage of the Tour de France cycle race. The UK declared a heat wave, set at Met Office Level 2/4, for the period 9–16 July 2010 for South East England and East Anglia. This was after temperatures reached 31.0 °C (87.8 °F) in London and night-time temperatures leveled around 21 °C (70 °F). The UK recorded its highest temperature of the year, 31.7 °C (89.1 °F), in Gravesend, Kent, as the British Health Protection Agency gave out health advice and claimed there had been "several hundred" more deaths than normal over the previous two weeks and some appeared to be linked to the heat on the 11th. July 11 and 12 saw heatstroke make several people ill throughout the Iberian Peninsula, European Russia, Belarus, eastern Poland and Ukraine. The heat wave that left Morocco for the Iberian Peninsula on the 11th was attributed to the regional hot air currents that departed from the Sahara in Northern Africa at about 1,000 meters in altitude, which facilitated a movement in the hot air towards the Balkans and Ukraine via the Straits of Gibraltar, Spain and Italy. On July 11, temperatures skyrocketed in Vienna, Berlin, Munich, Amsterdam, Madrid, Lisbon, Zurich and Bucharest. More heavy thunderstorms hit the High Swiss Alps, accompanied by heavy snow in some places. Forty passengers were hospitalised with dehydration in Germany when 3 ICE trains' air conditioning system broke down in temperatures approaching 40 °C on the 11th. One thousand luckier passengers switched trains. Deutsche Bahn apologized for its ICE trains breaking down. Hartmut Buyken, chairman of passenger association Pro Bahn, told radio station hr-INFO that the trains were ruined by cost cutting measures, and weren't selling as well in international markets as the French TGV trains. A 2007 image of German express ICE 3 transit train near Ingolstadt. On the 12th, Portugal, Spain, Germany, Great Britain, Belgium, France, and the Czech Republic all suffered the hottest temperatures of the year, and the heat wave was most likely to continue over the weekend, according to German meteorologists. 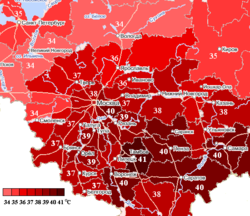 Most of Germany, including Berlin, recorded temperatures of 38 °C (100 °F) in some places. On the popular North Sea island of Helgoland, the temperature was only 20.5 degrees. In Berlin, the highest temperature was recorded at 38.9 °C (102.0 °F) as 3 more non-air conditioned local passengers trains had to be evacuated due to overheating of the interior passenger compartments, leading to passengers getting heat stroke, Deutsche Welle reported. Hans-Dieter Muehlenberg, chief of a local rescue squad in Berlin told the German news agency DAPD he had found the temperature in a local train had reached 50 °C (122 °F) and that nine people had to be hospitalized for dehydration. Later on, official reports from the rescue squad denied that 9 people reported dead had died and that the air conditioning systems fail to cool the trains in temperatures over 32 °C (90 °F). Deutsche Bahn paid 500 Euros for the heat victims without a doctors note. According to the German Meteorological Service (DWD), the soaring temperatures were set to last for a week. Belgian authorities were worried about water shortages as a result of both the hot weather and lack of rain. The water authorities in the eastern town of Bullange warned that several water sources have dried up. The Belgian interior ministry said that three other communes in the southeast of the country have also appealed for emergency water supplies. The Czech Republic exceeded 37.8 °C (100.0 °F) for the third day running, as doctors in the Czech Republic issued safety advice according to the Voice of Russia. High temperatures were also occurring in parts of Slovakia and around the Black Sea. The heat wave begins to end as heavy rain hits the Swansea-Port Talbot region of Wales, Devon, central Ireland and parts of eastern France. Both Alpine and North Sea thunderstorms sweep across southeast and northwest Germany respectively. Heavy rainfall is also reported in parts of the Netherlands, Ireland, Normandy and the English Midlands on the 13th. Both melting glaciers and heavy rain in the Alps caused avalanches and flash floods in Switzerland. A nationwide near-record temperature of 39.4 °C (102.9 °F) was recorded in parts of Sion in Valais Canton, south west Switzerland on the 13th. Thunderstorms hit the English Midlands, Oxfordshire, Ireland, Northern Ireland and parts of the Swiss Alps. The heat wave ended in the British Isles and Northwest Europe on the 14th. July 16 saw the heat wave peak in intensity throughout Italy, the Vatican, San Marino and Malta . The Civil Protection Board issued a heat warning for the 16th and 17th. The cities of Bolzano, Brescia, Florence, Genoa, Milan, Perugia, Rome, Turin, Trieste, Venice, Campobasso, Civitavecchia, Frosinone, Latina, Messina, Rieti, Verona and Viterbo. are at the maximum level 3 heat alert, and that on the 17th 3 cities in South Tyrol (which has the highest temperatures for 90 years) will also be affected. The Health Minister Ferruccio Fazio told the Health and Social Services of the regions, General Practitioners (MMG) and local Prefects to take emergency measures. Foggia's town council gave free meals to those over age 65 due to temperatures of 40 °C (104 °F) and Rome had issued over 200,000 bottles water to its people over three days. Heavy storms hit Vienna on July 16 and 17, ending the week-long heat wave in Austria. New heat record of Finland was recorded at Joensuu on 29 July when temperature rose to 37.2 °C (99.0 °F). In Sweden, temperatures were above the average maximum temperature, with Stockholm seeing temperatures of 32.5 degrees Celsius according to the Swedish Meteorogical Institute SMHI. The Russian high temperature record dating back to 1940 was beaten on 12 July, when Utta in the Kalmykian Republic, registered 45.4 °C (113.7 °F). The highest temperature at a non-automated station was 44 °C (111 °F) in Yashkul, Kalmykia, also beating the previous record. The record for Asian Russia was also beaten: 42.7 °C (108.9 °F) was recorded in Ust-Karsk on 27 June, beating the record of 42.3 °C (108.1 °F) set in Belogorsk, Amur Oblast, two days earlier. A heat wave hit Eastern Europe as exceptionally strong jet stream winds blew in from the Sahara across the Balkans and into both Poland and Ukraine on 10 June. The Polish Institute of Meteorology and Water Management (IMGW) warned of temperature in Poland exceeding 30 °C (86 °F) for the next 5 days, followed by heavy winds, rain storms, thunderstorms and possible flooding especially in the northwest of the country and neighbouring parts of Germany. A Portuguese man also died on the 7th, in Villar del Rey, Badajoz, Spain. Two Spaniards died of heat stroke as temperature hovered around 33 °C-35 °C in central Spain on July 9. One victim was in Central Spain and the other was in Sevilla. The woman from Sevilla had been admitted to the local Virgen Macarena Hospital said the woman had also had multi-organ failure. On July 11, temperatures skyrocketed in Vienna, Berlin, Munich, Amsterdam, Madrid, Lisbon, Zurich and Bucharest. More heavy thunderstorms hit the High Swiss Alps, accompanied by heavy snow in some places. Temperatures in the Iberian Peninsula climbed to an average of 43 °C as Spain witnessed temperatures up to 44 °C as the three-week-old heat wave continued; Madrid's temperatures climbed to 41 °C (106 °F). 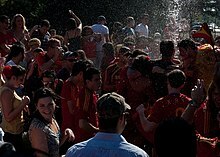 Spain suffered three deaths, including that of an 80-year-old man. The national meteorological agency, Aemet, warned of exceptionally warm central and southern Spain, with temperatures over the next few days reaching 39 °C in some areas. Temperatures of up to 40 °C (104 °F) hit the Portuguese town at Pataias on the 27th. All of Rebordelo, Santa Maria da Feira, Aveiro, Braga, Sobradelo da Goma, Povoa de Lanhoso, Oporto, Viana do Castelo, Coimbra, Viseu, Leiria, Albergaria-a-Velha and Oliveira de Azemeis were ablaze. The A1 motorway connecting Lisbon with Oporto was closed due to low visibility caused by the smoke on the 27th. The Portuguese Army dispatched about 150 soldiers to fire-affected towns. Two Italian water bomber planes were loaned to Portugal through the European Union's solidarity mechanism on July 28. Spain also provided its neighbours with water bomber aircraft, but Portugal requested further help from the EU and Spain. France readied a plane on the French island of Corsica, just in case things got any worse in Portugal. A heat wave hit Eastern Europe as exceptionally strong jet stream winds blew in from the Sahara across the Balkans and into both Poland and Ukraine on 10 June. The Polish Institute of Meteorology and Water Management (IMGW) warned of temperature in Poland exceeding 30C for the next 5 days, followed by heavy winds, rain storms, thunderstorms and possible flooding especially in the north-west of the country and neighbouring parts of Germany. In mid June, Eastern Europe experienced very warm conditions, whilst Central Europe was being flooded. Ruse, Bulgaria hit 36.6 °C (97.9 °F) on the 13th making it the warmest spot in Europe. Other records broken on the 13th includes Vidin, Bulgaria at 35.8 °C (96.4 °F), Sandanski, Bulgaria hitting 35.5 °C (95.9 °F), Lovech and Pazardzhik, Bulgaria at 35.1 °C (95.2 °F) as well as the capital, Sofia, hitting 33.3 °C (91.9 °F). The heat comes from the Sahara desert and is not associated with rain. This helped the situation with high water levels in that part of the continent. On the 14th, several cities were once again above the 35 °C (95 °F) mark even though they did not break records. The only cities in Bulgaria breaking records were Musala, peak hitting 15.2 °C (59.4 °F), and Elhovo, hitting 35.6 °C (96.1 °F). On the 15th, Ruse, Bulgaria peaked at 37.2 °C (99.0 °F). Although it was not a record, this was the highest temperature recorded in the country. Five Bulgarian cities broke high temperature records that day. Heavy rain fell in Podgorica, Bucharest and parts of eastern Serbia on July 16. Both the 16th and 17th saw Sandanski's thermometer hit 37.2 °C (99.0 °F). This temperature value was approaching the national record of 37.5 °C (99.5 °F) from 2007. The National Meteorological and Hydrological Institute (NIMH) at the Bulgarian Academy of Sciences (BAS) were concerned with the changing temperature patterns. On July 17, Bulgaria recorded temperatures in excess of 37C° and 8 young people drowned swimming and bathing in various lakes. Both temperatures 30-40C wild fires hit land near Tbilisi between August 1 and 3. A 3-day wildfire consumed about 150 hectares of forest in Georgia's central region is now under control according to both the Environment Protection Division of the Georgia Department of Natural Resources. Central Kazakhstan witnessed a heavy spike in temperatures and a Kazakh farmer died of heat stroke on August 11. The hottest recorded temperature in Kazakhstan was 53.1 °C (127.6 °F), which set a new record, as the hottest temperature ever recorded in that country. The abnormal heat wave was also experienced in Russia, causing fires throughout the country, the worst drought in nearly 40 years, and the loss of at least 9 million hectares of crops. According to head of Rosgidromet state weather agency Alexander Frolov, there was no such heat during the last 1000 years. 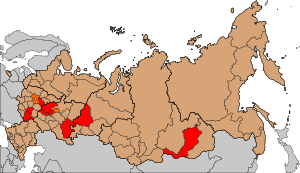 The highest temperature ever recorded in Russia was 44.0 °C (111.2 °F), set on 11 July, in Yashkul, Kalmykia, beating the previous record of 43.8 °C (110.8 °F) set on 6 August 1940, also in Kalmykia. On 25 June a temperature record was set in the Asian portion of Russia, at Belogorsk, at a reading of 42.3 °C (108.1 °F). The previous record in the Asian portion was 41.7 °C (107.1 °F) set at Aksha on 21 July 2004. A heat wave started in Moscow on the 27 June, as temperatures reached 33.1 °C (91.6 °F), and stayed around 30 °C (90 °F) for the rest of the week. It also caused temperatures to rise noticeably in Yakutia, the Siberian Kuznetsk Alatau mountain range and the Volga Federal District. On 28 June Kvass sales boomed in Russia. On 30 June, the heat in Yakutia reached the temperature of 35.3 °C, as both the Siberian Federal District and Ural Federal District began to overheat. By the end of June, 1,244 people had drowned in Russia after swimming. On 3 July, a heat wave hit parts of Ryazan Oblast, Krasnodar Krai, and the cities of Copenhagen, Bucharest and Budapest, killing a Romanian man with heat stroke. Heavy thunderstorms hit the High Swiss Alps, accompanied by heavy snow in some places. On 5 July, the Russian emergency ministry confirmed that almost 300 overheating people had drowned swimming in various lakes, canals and rivers during the heat wave. In one case at least 63 people died in one day alone. An emergency ministry spokesman told the Ria Novosti news agency that 285 people had died in Russia's waterways. The 285 deaths occurred mainly due to the fact that they had swum in dangerous locations, they were ill-prepared and/or were dangerously drunk. A Bulgarian tourist also fell ill with sun stroke in Ryazan. Moscow was hit by a minor cholera outbreak on 5 July. Highs of nearly 34 °C (93 °F) in Moscow broke records. Earlier in June, Minsk hit 30 °C (86 °F) and Kiev's temperature soared to 34 °C (93 °F). Saint Petersburg, however, has yet to see the 30-degree mark. Temperatures hit a record-breaking highs of 37 °C in several regions in the Central Federal District on 5 July. In addition, the temperatures were becoming slightly hotter than usual throughout the Siberian Federal District. The official record temperature for European Russia was set at 43.8 °C on 6 August 1940. The Siberian record was set at 35.3 °C in the Yakutia, which was also seeing its provincial temperature rise. Russia's weather forecasts said it was the most prolonged heat wave since 1981. Moscow's City Hall sent out water tankers to put water on the roads to prevent the tarmac from melting. Moscow's temperature was 31 °C (88 °F) on 7 July. At the same time the heat in Yakutia recorded 35.3 °C. A record-breaking heat wave in late June saw temperatures reach 37 °C in several central Russian regions, sparking forest fires and causing heat stroke in many people in various parts of the Central Federal District and Ural Federal District. On the 11 and 12 July, many people across Europe fell ill due to heat stroke caused by the very high temperatures reached on these two days. A total of 14 regions suddenly overheated on the 11 to 13 July, including Tatarstan, Bashkortostan, Orenburg, Saratov, Samara Oblast as the heat cooked the partly drought hit Volga Federal District. Nineteen of Russia's 83 regions declared a state of emergency after crop failure caused by the heat-induced drought. Electricity demand went up by as much as 6% in some Oblasts, leading to power supply problems. Sales of ice-cream also went up by 10—15%. The lead into the summer heat wave in 2010 began as an abnormally warm autumn and spring in 2009—2010. World scientists consider the heatwave abnormal by today's standards, but warn that it will soon become the norm throughout summertime. The 3 week heat wave hit near-record temperatures in Russia and Ukraine on the 13 July; with near-record temperatures of 40 °C in Saint Petersburg, Moscow and Kaliningrad. On 13 July the Russian Bird conservation Union (RBCU) said that the heat was killing most of European Russia's birds, especially those in Moscow. Meteorologists considered it likely that temperatures would reach up to 36 °C (97 °F) later in the week. On 14 July, central Russia saw record temperatures and was predicted to face 38 degrees Celsius by the weekend, higher than the all-time temperature record of 36.6 °C, set in August 1920. Owing to the drought, the government considered introducing a state of emergency in another two regions of the Russian Federation. Both Volga Federal District and Southern Federal District reported large rises in temperature. The City of Yakutsk, with temperatures set to stick at 35 degrees for the next few days. Dagestan was also reported to be suffering a heat wave that day. 5 Italians, a Latvian and a Russian also drowned in the lower reaches of the Volga, near Volgograd, all of whom were apparently drunk. As water levels in the River Volga have dropped Volga Federal District's drought swimming has become more risky due to hidden objects being closer to the surface and increased flying insect activity. In the first half of July, average temperatures in Moscow were 6.2 °C above average. The hottest July on record in the city, in 1938, was an average of 5.3 °C higher than average. Approximately 400 people had drowned by mid-July. 1,200 Russians had died June 1 and July 15 due to swimming whilst drunk. Six children and a Ukrainian tourist also drowned, whilst sober, in the Sea of Azov. Vadim Seryogin, from the Russian Emergency Ministry said that 95% of the drowned had been consuming alcohol. 9,000,000 hectares of farmland were destroyed along with 20% of the grain harvest in what appears to be the worst drought in 130 years. In St. Petersburg, various temperature records were broken in July, and the maximum yearly temperature record was set on Wednesday, 28 July, when the temperature was 35.3 degrees Celsius (95.5 degrees Fahrenheit). This record was superseded on 7 August — 37.1 degrees Celsius (98.8 degrees Fahrenheit). The maximum temperature in Moscow was set on 29 July, when it was 38.2 degrees Celsius (100.8 degrees Fahrenheit). On July 30, wildfires killed 25 people, leaving more than 2000 people homeless. The fires were still burning on 1 August. Likely in part due to the heat wave and smoke from forest fires, Moscow recorded 14,340 total deaths in the month of July, 4,824 more than the number recorded in July 2009. Pollution levels in the city were five times higher than normal. On 1 August, the Patriarch of Moscow and All Russia led a holy mass to remember the 28 who had died since July 30. The forest fires came as Russia was experiencing its worst drought in just over 100 years. Russia's Emergency Situations Ministry said 774 forest fires had been registered, 6 new fires were rumoured to have started near Moscow, and a regional forestry department in the Central Federal District reported that the fires now cover approximately 100,000 hectares. Some 4,000 soldiers were called in to help fight both the 6 rumoured and several known fires in the Moscow Oblast. Over 5,000 people have been evacuated from their homes, and Vladimir Putin organised an emergency meeting for August 2, with the governors of the various regions in the Central and Southern Federal District devastated by the fires. The grain harvest in these areas was also destroyed. August 2 saw hundreds of wildfires threatening more than 200 villages around both Voronezh, Moscow, Nizhny Novgorod and in Mordovia the chief of National Centre for Crisis Situations, General Vladimir Stepanov said. The Volga Federal District saw 625 homes destroyed and Voronezh saw over 200 destroyed and more than 1,000 in both places evacuated," general Stepanov said as firemen, troops and local farmers struggled to drive the fires back from the cities of the Volga Federal District. A heat wave hit Eastern Europe as exceptionally strong jet stream winds blew in from the Sahara across the Balkans and into both Poland and Ukraine on 10 June. The Polish Institute of Meteorology and Water Management (IMGW) warned of temperature in Poland exceeding 30 °C (86 °F) for the next 5 days, followed by heavy winds, rain storms, thunderstorms and possible flooding especially in the north-west of the country and neighbouring parts of Germany. 12 June saw the temperature of 34 °C (93 °F) in Kiev registered though the city was previously forecasted to hit the 37 °C (99 °F) mark, breaking the previous Kiev record that had stood since 1946 (33.3 °C (91.9 °F)). Ukrainian Galicia and the Crimea peninsula also saw temperatures rise sharply. On 6 July, 3 low pressure areas moved towards and settled near the Black Sea after a week a high pressure in the region's jet stream far northward in its trek through Europe. The Accuweather.com GFS numerical model predicts the same weather for the next week and an even worse heat wave for the week of the Accuweather.com forecast Earlier in June, Minsk hit 30 °C (86 °F) and Kiev temperature soared to 34 °C (93 °F). Saint Petersburg had yet to see the 30 °C (86 °F) mark. Heavy storms in Kiev at the end on 17 July. Temperatures of 30–35 °C (86–95 °F) were registered in almost the whole Ukraine in July, while in the east and in the northeast, they reached 36–39 °C (97–102 °F). It was revealed on 19 July that 800 Ukrainians, including 115 kids, had drowned since 1 May. Temperatures began rising again in Ukraine in early August, with 35–40 °C (95–104 °F) being recorded at many central and eastern locations, including the city of Kiev, in the first week. Wildfires broke out throughout Ukraine late July/early August. According to Ukrainian authorities these fires where not as severe as the 2010 Russian wildfires. A total of 522 fires, including 122 in residential areas were registered on August 11. No wildfires where recorded at Chernobyl during the heatwave., but fires reached the Bryansk region, east of Chernobyl. On August 6 the Ukrainian Weather Forecasting Center forecasted the heatwave would continue at least until August 18 and probably till the end of August and that extremely high fire risks would remain in Ukraine, apart from western Ukraine. Indeed, a major cool-down did take place on the 18th, with showers and thunderstorms ushering in cooler temperatures (mid-20s°C (mid/late-70s°F)). Pigeons cooling off in Kharkiv during 37 °C weather. Heavy rain falls in the town of Rize, Turkey and along the Turkish/Armenian border on the 15th of July. Myanmar's hottest temperature on record was set on May 12, at 47.2 °C in Myinmu, Sagaing Division. The previous hottest temperature record in the country was set in May 1980 at 46.0 °C in Magwe, Magwe Division. On May 23, 12 villagers were killed trying to put out a forest fire in the southwestern Chinese province Yunnan. June 27–29 saw the heaviest rain fall in Luolou township in the Chinese Guangxi Zhuang autonomous region in 300 years. 6,673 people were affected; as the town was cut off, schools closed and people travelled by boat. The heat wave hit China's Liaoning Province and Hubei Province on the 2nd. The heat wave hit Wuhan city, Hubei Province, Qionghai, Hainan Province, Nanning city, Guangxi Zhuang autonomous region, on July 3. As the hot weather swept most of northern, central and southern China some regions recorded temperatures soaring up to 39 °C (102 °F). July 5 saw temperatures of 40 °C (104 °F) scorch 16 provinces, autonomous regions and municipalities. The National Meteorological Center (NMC) issued a yellow heat alert to the provinces of Shandong, Anhui, Jiangsu, Gansu, Beijing, Inner Mongolia Autonomous Region, Shaanxi and Shanxi Province on July 5. About 400,000 square kilometres (150,000 sq mi), or 37.8%, of Inner Mongolia were hit by drought. Xingqing Lake, in the Xingqing Palace Park, turned crimson; park spokesman Liang Zibin blamed a mixture of pollutants and high heat for the aquatic phenomena. There were serious problems with green algae in the river surrounding the ancient city of Xi'an. Lakes and rivers turned green and red as a result of algae blooms flourishing in the hot weather, according to the Xinhua news agency. July 5 saw Beijing set a new highest temperature record at 40.3 °C (104.5 °F). Near record heat waves hit both Gansu Province, Guizhou and Inner Mongolia on the 5th. A yellow-level heat alert was issued in the provinces of Guangdong and Hainan as well as Guangxi Zhuang Autonomous Region, due to predicted temperatures of 35 to 38 °C (95 to 100 °F) on July 5. Bajin, Macau and Hong Kong witnessed a heavy spike in temperatures on the 7th. Temperatures in Sichuan and Quzhou rose sharply to 35 °C (95 °F) as the average heat wave temperature 13 of the China's provinces and regions reached over 35 °C. A record temperature of 41.8 °C (107.2 °F) hit Beijing on the 7th and were predicted to reach 40 °C (104 °F) on the 8th. On 7 July, five people died and eight were missing after torrential rains caused flash floods in Huangyuan County, in China's overheating Qinghai Province, according to local government sources. Rumours that a homeless old man had also been crushed to death in a partly collapsed house were denied by rescue workers. July 8 saw the highest temperature and heavy rain storms across the People's Republic of China so far. China's National Meteorological Centre (NMC) predicted that temperatures would fall by the 9th. Local authorities and the NMC also issued an orange flood alert in central and southwest China were put on flood alert and the worst floods for 40 years hit the regions. Heavy rains hit Hubei and Anhui provinces on July 8 and caused a 1 meter deep flood which killed 1 person and made 500,000 homeless. The storm moved southeastward over the next day, helping to dissipate the local heat wave. Forest fires hit parts of Qinghai Province on July 20. There was a forest fire in the Greater Hinggan Mountains of Heilongjiang Province according to Sun Xiguo, director of the fire control headquarters of Greater Hinggan Mountains. More than 7,000 people in Heilongjiang and another 3,000 from Inner Mongolia battled the fires as the province's ground temperature had been as high as 50 °C (122 °F) on August 4. The summer of 2010 was the hottest since Japan began keeping records. Major Japanese cities recorded their highest temperatures between July 15 and September 6. According to the Japan Meteorological Agency (JMA)'s confirmed report, major Japanese cities on average, were at their highest level of hot temperatures, in August 2010. Fukuoka, Kyushu, Fukuyama, Hiroshima, Hirakata, Osaka, Hiroshima, Kyoto, Okayama, Osaka and Takamatsu, Shikoku were all above 30 °C (86 °F) average temperatures in August that year. And low temperatures in 25 °C (77 °F) day are: 50 days in Tokyo, 49 days in Osaka, 48 days in Takamatsu, 47 days in Fukuoka, Hiroshima and Nagoya, 43 days in Kanazawa, 40 days in Yonago and 38 days in Niigata, all during same period. Following the above, 35 °C (95 °F) high temperature days are: 37 days in Kumagaya, Saitama, 33 days in Kyoto and Isesaki, Gunma, 31 days in Tokai, Aichi, 29 days in Tottori, Kofu, Yamanashi and Nishiwaki, Hyogo, 25 days in Osaka and 24 days in Hiroshima, all during same period. According to the Ministry of Health, Labour and Welfare of Japan, a record of 1,718 people died from heat stroke. An extreme heat wave hit Mongolia on June 23 with the temperature reaching as much as 41 °C (106 °F) in some places. The drought and heat wave combined to make wild fires inevitable. At the time, 73 wild fires had already been registered in the country, with four more erupting on July 4. The Khentii Mountains were hit hard, with Khentii Province overheating and the Khan Khentii Strictly Protected Area facing a possible drought on the 5th. Officials claimed the forest fires of the 6th were caused by the heat wave and drought. The fires killed 3 people, injured 6, killed 936 head of livestock and caused about 910 million Tugrig (U.S. $670,000) in damages, officials said. About 984 fire-fighters, 164 border guards and 2,022 locals fought the bushfires. The fires started in Selenge Province and then Tov Province on the 6th, but had spread to another 12 aimags (provinces) by the 7th, according to the head of the fire department of the general emergency management authority. The emergency authority said they wanted people to stay out of the danger zones unless they were fighting the fires and called upon the public for more volunteer firefighters. July 7 saw even more bush fires in the already burning counties. Temperatures soared to 53.5 °C in Mohen-jo-Daro on May 26, and twelve cities in Pakistan saw temperatures above 50 °C. The previous record for Pakistan, and for all of Asia, was reached at 52.8 °C (127 °F) in Sindh Province on June 12, 1919. By May 27, the temperatures higher than 45 °C hit many areas across the country, at least 18 people died in Pakistan. Hanoi was hit by a heat wave from June 29 to July 2. Daytime temperatures were between 40 °C and 35 °C, while night time temperatures were 30 °C. Droughts and power cut were an imminent threat in the north of Vietnam. There were numerous heat records broken in the Middle east as well, such as in Bahrain, where the country set its hottest June temperature on record at 46.9 °C on June 20. There was also plenty of heat in Iraq, where a new unofficial hottest temperature record was set on June 14, 2010, at 52.0 °C (125.6 °F) in Basra. The previous record was 51.7 °C (125.1 °F) on August 8, 1937, in Ash Shu'ayba. On July 26 the heat reached near-record levels over Iraq. In Israel, the year 2010 was the hottest on record, and average temperatures were 2-3 degrees Celsius higher than the average. The temperature in Kibbutz Almog, near the Dead Sea, on August 7 was 51.4 °C (124.5 °F). The temperature was the hottest measured in 68 years. The summer lasted till December, when a severe storm hit the Israeli shore, with waves rising up to 14 meters in height and 70–220 mm fell in 3 days as well as 1–2 meters of snow on Mount Hermon. The temperature nearly break the record of July 2000, in Marka (civil/mil airport) Amman, where temperatures reached 42.2 °C according to the METAR recording at the mentioned airport, adding that temperatures were nudging the 40 °C in many consecutive days, and actually went beyond it. Meanwhile, it was unofficially reported that record were broken in the Tela' Al-Ai/Sweileh area, according to "JordanWeather" for Meteorological consultancies, where the temperature was reported to be 40.3 °C on August 1. Unofficial record temps were also reported in Anjara/Ajloun governorate where temperature hit the 39.1 °C on the 7th of August. By August 20, another intense heat wave arrived, and broke the previously mentioned record in Marka airport, and the temperatures reached 43.5 °C. The temperature in Tela' Al-Ali/Sweileh, Madaba, Anjara/Ajloun, reached 42.3 °C. In Kuwait, the temperature in Mitribah reached 54.4 °C on June 15 which was the highest temperature ever recorded in Asia, and is 2 degrees lower than the record for Death Valley, USA of 56.7 °C degrees, and 4 degrees lower than the highest temperature ever recorded on Earth of 58 °C at Al-Aziziya, Libya but scientists argue that this temperature is inaccurate as the thermometer was above the Tarmac floor and in the direction of the sun. In August 2010, the heat index reached 64 °C at Al-Nuwaiseeb due to the high humidity. On July 26 the heat reached near-record levels over Kuwait. On July 14, the highest temperature in Qatar reached 50.4 °C (122.7 °F). The heat wave hit Saudi Arabia in June, setting an unofficial all-time temperature record on June 22, at 52.0 °C (125.6 °F), breaking the previous record of 51.7 °C (125.1 °F). The heat wave also caused sand storms to occur, causing a blackout after eight power plants in the country were knocked offline. In addition to the heat, Lebanon has been through the worst drought ever since 1931 – the temperatures reached 47.6 °C (117.68 °F) in the coast and 37 °C (98.6 °F) in the Beqaa Valley. And the summer unusually prolonged until 5 December. The spring started pretty early that year, after passing through a stormy January with no snow, which only fall on 21 January and lasted until the last days of February. There were several rain events, however, such as when Heavy rain fell in most of East Azarbaijan Province and West Azarbaijan Province on the 14th of July . Heavy rain and thunder storms also hit the town of Samail in Oman's northern, coastal mountain range on July 14. Niamey, Niger took in refugees from Tillabéri Department 12 days before, after they turned up hoping the city would help them. The towns of Kongomé, Zinder, Tanout and Dalli were the worst hit by the drought by May 3. Dehydration was reported to have killed 1 person in Niger, while others in the region were at risk of water shortages on June 1. A new heat wave hit Niger on June 21, causing an increased area of drought; causing crop failure and the threat o widespread famine. In Chad, the temperature reached 47.6 °C (117.7 °F) on June 22 in Faya-Largeau, breaking a record set in 1961. Sudan reached 49.7 °C (121.5 °F) in Dongola the same day, breaking a record set in 1987. Niger broke its own record set in 1998 the next day at 48.2 °C (118.8 °F) in Bilma. Three years of famine and more recent sandstorms devastated Niger on July 14, prompting the new military junta to appeal for international food aid. On July 24, the British Red Cross flew its logistics teams to Niger to help the army and local officials with transportation. The relief effort has already been made possible by the response to the Red Cross's West Africa Crisis Appeal which aims to raise £500,000. According to UN agencies, 200,000 children need treatment for malnutrition in Niger alone, as Oxfam puts out an £7,000,000 appeal to cover both the Chad and Niger. France sends food and cash aid to Mali on July 25. On July 26 the heat reached near-record levels over Chad and Niger, and about 20 had reportedly died in northern Niger of dehydration on July 27. On August 1, Gadabeji, Niger suffered 35 °C (95 °F) heat and drought. The exceptionally heavy rainfall of 2009 destroyed crops and devastated the year's harvest. The resulting fall in production in staples like maize, millet and sorghum affected much of West Africa's fragile Sahel, including neighbouring Chad and northern Nigeria. August 3 had Burkina Faso hit by a drought, as 4,500,000 Burkinans and 6,700,000 Nigeriens faced starvation. On May 12 and 26, Mauritania, the Sénégal River Area, and neighbouring parts of both Senegal and Mali faced both a drought and famine. Seven people died in Ghaidi Magha, Mauritania, near the Malian border on May 18. The heat wave that left an overheating Morocco for the Iberian Peninsula on July 11 was attributed to the regional hot air currents that depart from the Sahara desert in Northern Africa at about 1,000 meters in altitude, which facilitated a movement in the hot air towards the Balkans and Ukraine via the Straits of Gibraltar, Spain and Italy. Unusually hot weather was also reported in parts of Algeria on the 11th. Sudan all recorded their hottest all-time temperatures on record on June 22 and June 23, hitting the mid 40s Celsius in places. In late May, record high temperatures were recorded in Ontario and Quebec. Ottawa, Ontario reached 35.8 °C (96.4 °F) on May 26, the highest temperature ever before the summer solstice. The same hot and dry airmass resulted in damaging wildfires in Quebec. In early July, a major heat wave gripped Eastern Canada. Between July 4 and 9, temperatures of 35 °C (95 °F) were common in major cities of Toronto, Ottawa, and Montreal, coupled with high humidity. In Quebec, more than 100 deaths were blamed on the heat. A third heat wave struck the region in late-August and early-September. In Frederick, Maryland, the temperature reached 106 °F (41 °C) in early July. Power outages in New York and in Southern Ontario were reported to have been caused by the heatwave. June 24 saw a high pressure zone settle between North Carolina and Bermuda. A two-day-long heat wave hit the more rural parts of Texas on July 1. From July 4 to July 9, 2010, the majority of the American East Coast, from the Carolinas to Maine, was gripped in a severe heat wave. Both Philadelphia and New York City, as well as Baltimore, Washington, Raleigh, and Boston, eclipsed 100 °F (38 °C). Many records were broken, some of which dated back to the 19th century, including Wilmington, Delaware's temperature of 103 °F (39 °C) on Wednesday, July 7, which broke the record of 97 °F (36 °C) from 1897. Philadelphia and New York eclipsed 100 °F (38 °C) for the first time since 2001. Frederick, Maryland and Newark, New Jersey, among others, exceeded 100 °F (38 °C) for four days in a row. Cleveland, Ohio, was rising into the upper 90s on July 8. Meanwhile, various authorities on the U.S. Eastern Seaboard issued extreme heat alerts, with the temperature being forecast to rise well beyond 30 °C in some areas on the 5th. The American northeast was severely affected as New York City saw a record temperature of 103 °F (39.4 °C) on July 6, and the heat hit 100.4 °F (38.0 °C) in Boston, and 40.6 °C in Baltimore on the same day, breaking the standing Baltimore record from 1983. New York City saw temperatures as high as 35 °C in some areas and it was predicted to reach 38 °C the next day. A report released by the Wall Street Journal on July 7 stated that June saw sales rise over the Independence Day holiday, especially along the East Coast of America. By July 3, retail sales had risen by 3.9% from the year-ago period and 1% over the previous week, according to the International Council of Shopping Centers and Goldman Sachs and Johnson Redbook Research also showed a sales gain in the final week of June, citing the hot weather. Both the American East Coast and parts of the American Midwest had record high temperatures, killing two people on the 8th. Authorities in Washington, D.C., New York City, Maine, Ottawa, Montreal and Toronto issued safety advice to its residents. Several power outages across the United States occurred due to increased demand, and also a transformer fire; lack of air conditioning led to the death of an elderly Philadelphia man and a homeless woman in Detroit. Canadian media outlets also stated that there had been a large increase of people visiting hospital during the heat wave, such as Montfort Hospital, which reported 158 patients in one day. The Associated Press reported that "the hot weather was blamed for the deaths of 89-year-old Edward Pilch in Whitehall, PA, and a 46-year-old woman in Queens." The heat also caused rail disruptions in Washington after the metal track expanded and could not be contained by the dampers. The BBC stated that electricity providers were "urging consumers to cut back on energy use to relieve the stress on the power system ... in Philadelphia alone, 8,000 people lost power due to increased demand on Tuesday [6th July]" News agencies stated that people had been staying in air-conditioned churches to avoid the heat. Consolidated Edison sent out dry ice to customers with no electricity. The U.S. East Coast and parts of the Midwest saw temperatures reaching up to 38 °C on July 11. The electricity grid in New York City was near collapse as Consolidated Edison cut electricity to air conditioning units and 20,000 homes and businesses to ease the burden on its failing system, according to The New York Times. Various utilities urged customers to use less electricity as the aging power grid began to falter under the heat wave that ran from Virginia to Maine via New York. About 375,400 customers in the New York City neighborhoods of Flushing, Gowanus, Forest Hills and Brooklyn Heights were victims of limited power outages in New York on July 11. For the Midwest became more related[clarification needed] to the extreme high humidity, above normal rainfall from thunderstorms across much of Iowa, Wisconsin, Nebraska and Illinois in the previous month leading up to the heat wave caused dew points to soar; in Newton, Iowa, where temperatures had been in the mid-90s F, the dew point reached 88 °F (31 °C) on July 14, one of the highest ever recorded in the United States. The heat index reached 128 °F (53 °C) in Newton, Chicago's dew point of 83 °F (28 °C), matching readings from the 1995 heat wave that caused many deaths. Omaha, Des Moines and St. Louis also experienced high humidity levels. Manitoba and several states in the Central U.S. had heavy thunderstorms with a severe tornado hitting Northfield, Minnesota, on July 16. The heat wave ended in most of Canada and was reduced by thunderstorms in much of the United States. The heat continued through the second half of July but extreme heat was mostly confined to the Southeastern United States, giving relief to the Northeast and Upper Midwest as it had early in the month. The intense heat build-up again occurred over much of Plains states, Upper South and Lower Midwest; temperatures surpassed 40 °C (104 °F) in many locations. By August 3, the temperature in Wichita, Kansas, reached 109 °F (43 °C). Washington, DC had temperatures that surpassed 98 °F (37 °C) on 11 days during the summer of 2010, reaching a peak of 102 °F (39 °C) on July 6 and 7. By late July, the morgue in Pima County, Arizona, had become overwhelmed with over 300 bodies; of those, 57 deaths were attributed to immigrants crossing the Mexico – United States border, overwhelmed by the July heat. The heat wave was initially absent in the Western United States, where an unusually cool summer took place. However, this cool trend ended in the last week of September (beginning on Sunday, September 26, 2010), when 4 powerful anticyclones stalled in the Gulf of Alaska, over the Southern United States (especially Texas), over the Western United States (specifically over Northwestern Utah). However, before then, parts of Montana and parts of California saw slightly above-average temperatures on July 6. But beginning on September 26, the heatwave began to impact Western North America, along with the entire Western United States. On September 27, Los Angeles broke its all-time record high, recording a temperature of 113 °F (45 °C) in downtown Los Angeles, along with San Diego County, with a new record high temperature of 112 °F (44 °C). The Southwestern United States had near high temperatures from September 26 to October 2, and even hotter than that in some regions. The Western United States also experienced record high/near record high temperatures from late September to mid-October. By the end of October, temperatures within the United States returned to near-average, as the anticyclones weakened and then dissipated. ^ "The 2010–11 La Niña: Australia soaked by one of the strongest events on record". ^ NCDC, NOAA. "State of the Climate | Global Analysis, June 2010". National Oceanic and Atmospheric Administration. National Climatic Data Center. Retrieved 19 July 2010. ^ a b c Foundation, Thomson Reuters. "Humanitarian - Thomson Reuters Foundation News". ^ Hanley, Charles J. (August 12, 2010). "Long, hot summer of fire, floods fits predictions". The Associated Press. Archived from the original on 17 August 2010. Retrieved 12 August 2010. ^ "Perception of Climate Change: Examining Extreme Temperatures". JournalistsResource.org, retrieved August 21, 2012. ^ Hansen, James; Sato, Makiko; Ruedy, Reto (2012). "Perception of climate change". Proceedings of the National Academy of Sciences of the United States of America. Bibcode:2012PNAS..109E2415H. doi:10.1073/pnas.1205276109. PMC 3443154. ^ a b c d e f "Yahoo! Groups". Groups.yahoo.com. Retrieved 2010-07-28. ^ "Thunderstorm Discussion 13th - 19th June 2010 | Forum | National Weather of Atmospherics Forum - Whats The Weather Community - UK Weather Forum - UK Weather Forecasts". Nwaf.org.uk. 2010-06-19. Archived from the original on 2010-06-22. Retrieved 2010-07-28. ^ "Heatwave hits Europe". Euronews. 2010-07-02. Archived from the original on 2011-09-03. ^ a b c "Jim Andrews | Europe Hot Spell Could Become Major Heat Wave". AccuWeather.com. Archived from the original on 15 July 2010. Retrieved 2010-07-28. ^ a b c d "Heat wave sizzles North America, Europe - GlobalTimes". World.globaltimes.cn. 2010-07-08. Archived from the original on 2010-07-11. Retrieved 2010-07-28. ^ a b "Health warnings as Austria faces heatwave". Austrian Times. 2010-07-08. ^ a b c d "Heat wave continues in Switzerland - swissinfo". Swissinfo.ch. Retrieved 2010-07-28. ^ "Thunderstorm Zurich Switzerland". YouTube. 2010-03-22. Retrieved 2010-07-28. ^ a b "Mountain Tops, Thunderstorms & Power Cuts! | We all live in a Toblerone World @ OleOle". Oleole.com. 2010-07-11. Archived from the original on 2010-08-16. Retrieved 2010-07-28. ^ a b c d e f g h i j "Heatwave Grips Europe: Germany Swelters Amid Soaring Temperatures - SPIEGEL ONLINE - News - International". Spiegel.de. 2010-05-22. Archived from the original on 15 July 2010. Retrieved 2010-07-28. ^ a b c d e f g h i "Heat waves sizzling Northern Hemisphere - People's Daily Online". English.peopledaily.com.cn. 2010-07-12. Archived from the original on 15 July 2010. Retrieved 2010-07-28. ^ a b c d e "Rain set to break heatwave in China: NMC - People's Daily Online". English.peopledaily.com.cn. Retrieved 2010-07-28. ^ a b c "German rail operator evacuates overheated trains amid heat wave | Europe | Deutsche Welle | 11.07.2010". Dw-world.de. Archived from the original on 16 July 2010. Retrieved 2010-07-28. ^ a b c d "Heat Wave Hits Europe". Epoch Times. 2010-07-11. Retrieved 2010-07-28. ^ a b c d "Ansamed - An Ansa Site". Ansamed.info. Archived from the original on 2011-10-04. Retrieved 2010-07-28. ^ "Hur var vädret?". Hurvarvadret.se. Retrieved 2013-08-11. ^ Masters, Jeff (15 October 2010). "Paula dying; Zambia records its hottest temperature in history". Weather Underground. Retrieved 20 August 2018. ^ a b c "Spain Weather - Friday July 9, 2010". Typicallyspanish.com. 2010-07-09. Archived from the original on 2012-03-01. Retrieved 2010-07-28. ^ "Forest fires rage in Portugal". Terradaily.com. Retrieved 2013-08-11. ^ "Forest fires in Portugal" (in Portuguese). Forestry.pt. Archived from the original on 2013-09-14. Retrieved 2013-08-11. ^ "In Pictures: 'Portugal Forest Fire'". Monsters and Critics. 2010-07-27. Archived from the original on 2012-01-27. Retrieved 2013-08-11. ^ a b c "Portugal fights against forest fires". News.xinhuanet.com. 2010-07-28. Retrieved 2013-08-11. ^ "EU states rally as Portugal fights forest fires | euronews, europa". Euronews.net. Retrieved 2013-08-11. ^ "bTV - Времето - Централна емисия - 15.06.10". Btv.bg. 2010-06-15. Archived from the original on 2011-09-27. Retrieved 2010-07-28. ^ a b c d "НИМХ: Най-горещо е било в Сандански - Информационна агенция "Фокус"". Focus-news.net. Retrieved 2010-07-28. ^ "Wildfire Caused by Heat Wave under Control in Georgia". English.cri.cn. Retrieved 2013-08-11. ^ "Синоптики: в Приамурье июнь был в мае, а в июне наступил июль". amur.info. Archived from the original on 7 July 2010. Retrieved 2010-07-01. ^ "Погода в Волгограде. Температура воздуха и осадки. August 2010". pogoda.ru.net. Archived from the original on 2010-08-06. Retrieved 2010-07-29. ^ a b c d Olga Samofalova (14 July 2010). "Аномальная жара поднимает продажи воды, мороженого и вентиляторов". rb.ru. Archived from the original on 2010-07-17. Retrieved 28 July 2010. ^ "Бьющая все рекорды жара душит Россию впервые за тысячу лет :: Пожары в РФ". Top.rbc.ru. Archived from the original on 2012-03-02. Retrieved 2013-08-11. ^ "Центральная Россия переживает температурную аномалию, которой не было 1000 лет". Archived from the original on 2011-07-16. Retrieved 2010-08-09. ^ a b c d Masters, Jeff. "Russia records its hottest temperature in history; 97L develops near Puerto Rico". Weather Underground. Archived from the original on 22 July 2010. Retrieved 19 July 2010. ^ a b "Moscow in grip of heat wave". Euronews. 27 June 2010. Archived from the original on 30 June 2010. Retrieved 28 July 2010. ^ a b c d e f "Heat wave hits Russia". Voice of Russia. 14 July 2010. Archived from the original on 11 January 2012. Retrieved 28 July 2010. ^ "Heat Wave Boosts Kvass Sales". The Moscow Times. 2010-07-23. Archived from the original on 31 July 2010. Retrieved 2010-07-28. ^ a b c d e f F_1004 (2010-07-12). "Heat waves sizzling Northern Hemisphere - People's Daily Online". English.peopledaily.com.cn. Retrieved 2013-08-11. ^ a b c d e f g "Russian Heatwave: Hundreds Drown While Trying To Cool Off In Rivers And Lakes". Sky News. Archived from the original on 8 July 2010. Retrieved 28 July 2010. ^ Moscow correspondent Norman Hermant (2010-07-05). "Hundreds drown during Russian heatwave - ABC News (Australian Broadcasting Corporation)". Abc.net.au. Archived from the original on 9 August 2010. Retrieved 2010-07-28. ^ a b c d "Europe Hot Spell Could Become Major Heat Wave - International Weather Blog Weather Blog". Accuweather.com. Retrieved 2013-08-11. ^ Moscow correspondent Norman Hermant (5 July 2010). "Hundreds drown during Russian heatwave - ABC News (Australian Broadcasting Corporation)". Abc.net.au. Archived from the original on 9 August 2010. Retrieved 28 July 2010. ^ "Weather News - Hundreds drown during Russian heatwave". Weatherzone.com.au. 5 July 2010. Retrieved 28 July 2010. ^ a b c "We're having a heat wave. New daily high temperature records beat new cold records by nearly 5 to 1 in June". climateprogress.org. 5 July 2010. Archived from the original on 9 August 2010. Retrieved 28 July 2010. ^ "July's heatwave around the world". The Guardian. London. 2010-07-07. Retrieved 22 October 2010. ^ F_127. "Rain set to break heatwave in China: NMC - People's Daily Online". English.peopledaily.com.cn. Retrieved 2013-08-11. ^ a b Malpas, Anna (July 16, 2010). "Hundreds drown in Russia heatwave". Google News, Agence France-Presse. Archived from the original on 20 July 2010. Retrieved 19 July 2010. ^ Betonov, Yury (13 October 2009). "В Москву идет аномальная жара". Utro.ru. Retrieved 28 July 2010. ^ "Anomalous heat will become annual". RBC Information Systems (in Russian). 14 July 2010. Archived from the original on 22 July 2010. Retrieved 28 July 2010. ^ Ryabko, Sergey (14 July 2010). Пекло-2010 стало первой ласточкой. YTPO.ru (in Russian). Archived from the original on 17 July 2010. Retrieved 2 August 2010. ^ a b "Hundreds of Russians die from drowning during heatwave". Terradaily.com. Retrieved 28 July 2010. ^ Gordon, Sarah (5 July 2010). "Hundreds Drown During Russian Heatwave". Sky News. Archived from the original on 11 July 2010. Retrieved 2 August 2010. ^ a b "Extreme Heat Wave". Global-greenhouse-warming.com. Retrieved 2010-07-28. ^ a b "Moscow birds suffer in heat wave". RIA Novosti. Archived from the original on 17 July 2010. Retrieved 2010-07-28. ^ a b "Drunk Russians drown escaping heatwave - Weather : news, world". euronews. 2010-07-15. Archived from the original on 18 July 2010. Retrieved 2010-07-28. ^ Sinclair, Lulu (August 6, 2010). "Death Rate Surges In Russian Heatwave". Sky News Online HD. Archived from the original on 8 August 2010. Retrieved 7 August 2010. ^ a b c d "Russian Patriarch Prays For Rain As Fires Spread". Rferl.org. Retrieved 2013-08-11. ^ "30 Killed In Forest Fires In European Part Of Russia". Rttnews.com. 2010-01-08. Retrieved 2013-08-11. ^ "Yahoo! Groups". Groups.yahoo.com. Retrieved 2013-08-11. ^ dimakrozlovae (14 June 2010). "Kiev records summer heat wave record". Russiaandukraine.blogspot.com. Retrieved 28 July 2010. ^ "Hundreds drown amid Eastern Europe heat"[permanent dead link], Euronews.net, 20 July 2010. ^ Ukraine to face high heat - weather forecasters, UNIAN (2 August 2010). ^ "Forest fires extinguished in Luhansk region", Kyiv Post (30 July 2010). ^ "At least 625 hectares of forest hit by wildfire", Kyiv Post (5 August 2010). ^ "Official: At least 64 fires reported in Ukraine on Aug. 5", Kyiv Post (August 6, 2010). ^ "State Forestry Committee: Situation with wildfires in Ukraine difficult, but controlled", Kyiv Post (August 13, 2010). ^ "Three killed by fire in Luhansk region", Kyiv Post (August 12, 2010). ^ Russia counts environmental cost of wildfires Gilbert, N. (2010). "Russia counts environmental cost of wildfires". Nature. doi:10.1038/news.2010.404. ^ a b c d e f g Masters, Jeff. "NOAA: June 2010 the globe's 4th consecutive warmest month on record". Weather Underground. Jeff Masters' WunderBlog. Archived from the original on 19 July 2010. Retrieved 21 July 2010. ^ a b Masters, Jeff. "Asia records its hottest temperature in history; Category 4 Phet threatens Oman". Weather Underground. Jeff Masters' WunderBlog. Archived from the original on 28 August 2010. Retrieved 21 July 2010. ^ "No Operation". Presstv.ir. Retrieved 2013-08-11. ^ Watts, Jonathan (2010-03-25). "China sends emergency food to drought-stricken provinces". Guardian News and Media Limited. London: guardian.co.uk. Archived from the original on 28 March 2010. Retrieved 2010-04-11. ^ a b F_127. "Guangxi township isolated by flood - People's Daily Online". English.peopledaily.com.cn. Retrieved 2013-08-11. ^ a b c "Heat wave sweeps parts of China - China News". SINA English. Archived from the original on 7 July 2010. Retrieved 2010-07-28. ^ a b c d e "Heat wave hits China". Straitstimes.com. 2010-07-05. Archived from the original on 8 July 2010. Retrieved 2010-07-28. ^ a b c "July's heat wave around the world | World news | guardian.co.uk". London: Guardian. 2010-07-07. Archived from the original on 10 July 2010. Retrieved 2010-07-28. ^ "Temperature in Beijing reached 41.8 degrees Celsius - People's Daily Online". English.peopledaily.com.cn. Archived from the original on 14 July 2010. Retrieved 2010-07-28. ^ a b "Five dead, eight missing in flash floods in northwest China - People's Daily Online". English.peopledaily.com.cn. 2010-07-07. Archived from the original on 13 July 2010. Retrieved 2010-07-28. ^ a b "China to Battle Storms Following Heat Wave". English.cri.cn. Retrieved 2010-07-28. ^ "Forest fire continues to spread in NE China". Chinadaily.com.cn. 2010-06-28. Retrieved 2013-08-11. ^ a b Staff, eCanadaNow (June 1, 2010). "200 Dead in India Heatwave". eCanadaNow. Archived from the original on 17 July 2010. Retrieved 21 July 2010. ^ "India Heatwave Scorches The Country, Casualties Shoot Up - Thaindian News". Thaindian.com. 2010-06-01. Retrieved 2013-08-11. ^ Burke, Jason (2010-05-30). "Hundreds die in Indian heatwave". The Guardian. London. Retrieved 22 October 2010. ^ Vidal, John; Walsh, Declan (2010-06-01). "Temperatures reach record high in Pakistan". The Guardian. London. Archived from the original on 14 October 2010. Retrieved 22 October 2010. ^ "Relentless heatwave sweeps across hills too". The Times Of India. 27 May 2010. ^ Kanoko Matsuyama; Shigeru Sato (13 July 2011). "Heatstroke Deaths Quadruple as Japan Shuns Air Conditioners to Save Power". Bloomberg L.P. Retrieved 1 June 2012. "last year, when a record of 1,718 people died of heatstroke as the summer heat broke records." ^ a b c d e f g "Heat wave causes numerous wild fires in central Mongolia - People's Daily Online". English.peopledaily.com.cn. 2010-07-07. Archived from the original on 15 July 2010. Retrieved 2010-07-28. ^ a b c d e f "Heat wave causes numerous wild fires in central Mongolia - GlobalTimes". World.globaltimes.cn. 2010-07-07. Archived from the original on 2011-07-07. Retrieved 2010-07-28. ^ Vidal, John; Declan Walsh (1 June 2010). "Temperatures reach record high in Pakistan". guardian.co.uk. London. Retrieved 21 July 2010. ^ News Service, Pakistan (May 27, 2010). "Heatwave kills 18 across Pakistan". PakTribune. Retrieved 21 July 2010. ^ a b cathrin_ka (2010-06-29). "Survival Guide for the Next Heatwave". Vietnam. Archived from the original on 2010-07-30. Retrieved 2010-07-28. ^ a b c "Wunder Blog : Weather Underground". Wunderground.com. Archived from the original on 27 June 2010. Retrieved 2010-07-28. ^ "Summary of 2010" (PDF). Israel Meteorological Service. Retrieved 13 May 2011. ^ "High temp recorded at lowest spot on Earth: The Dead Sea". CNTN - China Central Television. 2010-08-09. Retrieved 2010-08-13. ^ "Summary of the rain period between 10 and 13 of December 2010" (PDF). Israel Meteorological Service. Retrieved 13 May 2011. ^ StOrM18 (2010-07-23). "Thunderstorm, July 14, 2010. In Mountains Of Oman - Netweather Community Forums". Forum.netweather.tv. Retrieved 2010-07-28. ^ Nossiter, Adam (2010-05-03). "Famine Persists in Niger, but Denial Is Past". The New York Times. Retrieved 22 October 2010. ^ "Drought threatens African humanitarian crisis - Channel 4 News". Channel4.com. 2010-07-01. Archived from the original on 4 July 2010. Retrieved 2010-07-28. ^ a b c Foy, Henry (2010-06-21). "Millions face starvation in west Africa, warn aid agencies". The Guardian. London. Archived from the original on 13 October 2010. Retrieved 22 October 2010. ^ "Niger: famine on the horizon?". FRANCE 24. Retrieved 2013-08-11. ^ a b Mbubaegbu, Chine (24 July 2005). "Red Cross flies team out on Niger famine mission". The Daily Telegraph. London. Archived from the original on 28 October 2010. Retrieved 22 October 2010. ^ "Sahara Raid May Endanger Hostage – Algerian Sources". Asharq Al-Awsat. 2010-07-25. ^ Hirsch, Afua (2010-08-01). "Niger's markets are full yet famine shadows the dusty roads". The Guardian. London. Archived from the original on 12 October 2010. Retrieved 22 October 2010. ^ "Niger: Famine-Struck Nation Sees Little Reason to Celebrate". AllAfrica.com. 2010-08-03. ^ "Thomson Reuters Foundation | News, Information and Connections for Action". Alertnet.org. Retrieved 2013-08-11. ^ "Mauritania heat wave kills 7". Magharebia. Retrieved 2013-08-11. ^ Rigaux, Pam (2010-07-08). "Frederick remains mid-Atlantic hot spot". The Frederick News-Post. Archived from the original on 2013-09-09. Retrieved 2013-09-09. ^ "First heat-related death in the New York City area confirmed | 7online.com". Abclocal.go.com. 2010-07-08. Archived from the original on 10 July 2010. Retrieved 2010-07-28. ^ "Toronto hit by blackout after transformer fire - Rest of World - World - The Times of India". The Times of India. 2010-07-06. Retrieved 2010-07-28. ^ "Blackout over after 250,000 without power in sweltering Toronto". Montrealgazette.com. 2010-07-06. Archived from the original on 9 July 2010. Retrieved 2010-07-28. ^ "HEAT WAVE: Eastern US cooks In Summer Heat, Temps Reach 100s". Huffingtonpost.com. 2010-07-24. Archived from the original on 27 July 2010. Retrieved 2010-07-28. ^ "Weather News | Highlights of the Great Eastern Heat Wave". AccuWeather.com. Archived from the original on 12 July 2010. Retrieved 2010-07-28. ^ "Hundreds Drown During Russian Heatwave - Earth Changes and the Pole Shift". Poleshift.ning.com. 2010-07-06. Retrieved 2010-07-28. ^ "2010 Heatwave in New York City". YouTube. 2010-07-06. Retrieved 2010-07-28. ^ a b "Heat wave may save June sales MarketWatch First Take". MarketWatch. 2010-07-07. Archived from the original on 10 July 2010. Retrieved 2010-07-28. ^ a b c "Heatwave causes power cuts in eastern US and Canada". BBC News. 2010-07-07. Archived from the original on 11 July 2010. Retrieved 12 July 2010. ^ a b EVA DOU (AP) (2010-07-08). "The Associated Press: Heat wave eases in Northeast, but misery persists". Google.com. Archived from the original on 13 July 2010. Retrieved 2010-07-28. ^ the CNN Wire Staff (July 7, 2010). "Power outages, one death reported in Northeast heat wave - CNN.com". Edition.cnn.com. Retrieved 2010-07-28. ^ "Severe weather threatens in heat which has already doubled last year's 90-degree tally". WGN Weather. 2010-07-15. Archived from the original on 2010-07-18. Retrieved 2010-09-26. ^ "Weather Video - An Extreme Week For Wisconsin and Minnesota". AccuWeather.com. Archived from the original on 20 July 2010. Retrieved 2010-07-28. ^ Cleek, Ashley. "Russian Scholar Warns Of 'Secret' U.S. Climate Change Weapon". Rferl.org. Retrieved 2013-08-11. ^ James C. McKinley Jr. (2010-07-28). "An Arizona Morgue Grows Crowded". The New York Times. Archived from the original on February 29, 2012. Retrieved 2010-07-29. ^ Andrews, Jim (8 August 2010). "Unusually Cool Summer So Far for Coastal California". AccuWeather. Retrieved 6 March 2011. ^ "L.A. Now". Los Angeles Times. 27 September 2010.